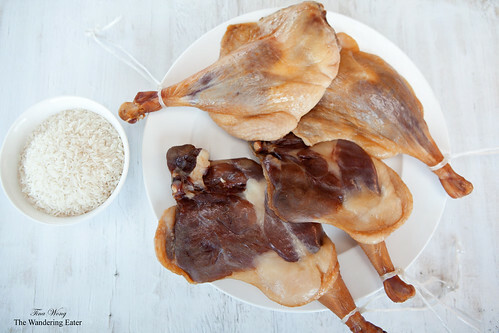 About a month or so ago when I had my goose centered Thanksgiving meal, I had leftover beautiful geese legs that I had to wonder, would it be possible to make Chinese cured goose leg (臘鹅腿)? Sure, there are those yellow cured duck legs hanging in most Chinese markets next to Chinese sausages but both are mediocre. Also, they don’t remind me of the glorious food filled days when I ate through to Hong Kong and China a few years ago when I visited family and vacation. I discovered after talking to my parents from their own taste memory, it’s essentially salt, Shaoxing wine, vodka (or Chinese rice wine), and soy sauce (for flavor and color). Three essential things you need are good ingredients (a given), cool, dry environment, and time. Place the geese legs in a container that has a lid and large enough to fit the legs. In a small bowl, mix the salt, vodka and Shaoxing wine and pour it over the geese legs and massage it to work the marinade into the meat. Take the soy sauce, pour and massage it again. You may add more soy sauce if the color looks too pale for you but refrain from adding too much before it will be very salty. Cover the duck with a tight fitted lid and let it sit in the refrigerator for 3-4 days. 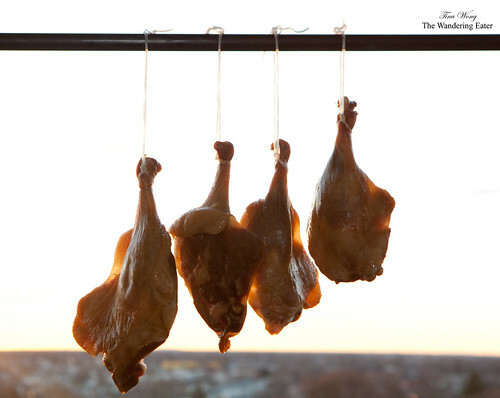 After the refrigeration period, find some clean meat hooks or use kitchen twine to tie and hang the geese legs in a cool, dry room or outside when it doesn’t exceed 45 degrees Fahrenheit for at least 3 days. You may accelerate the drying process slightly by heating the geese legs gently in the oven at 200°F (93°C) on a cookie sheet for 20 minutes. 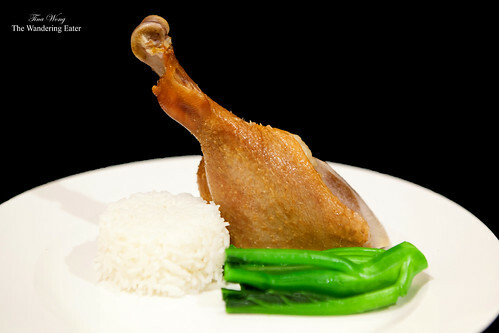 The only way to cook these geese legs is by steaming it and served with a bowl of rice. Since the size varies of these legs, it can range from 15-20 minutes (make sure it’s cooked through).